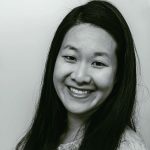 Published Aug 3, 2017 By Julia 1 CommentThis post may contain affiliate links. 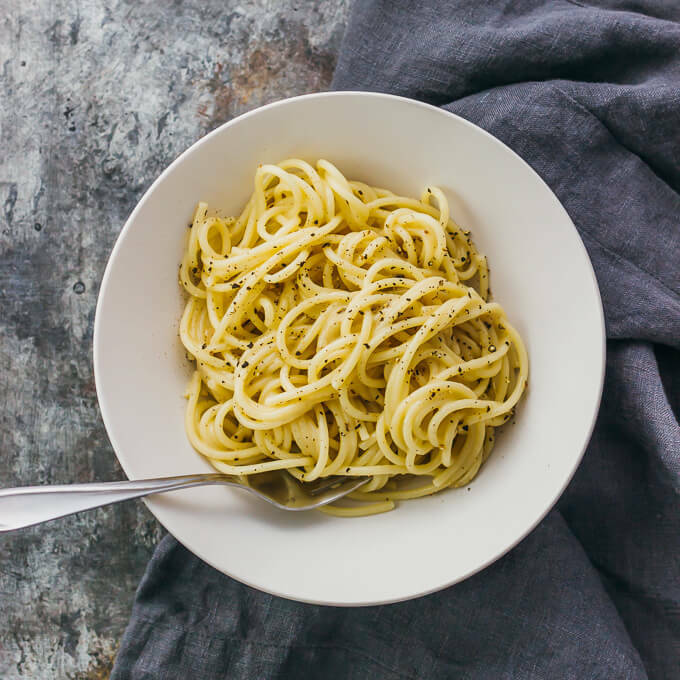 Cacio e pepe is one of the simplest pasta dishes you can make — spaghetti with melted parmesan cheese and black pepper. 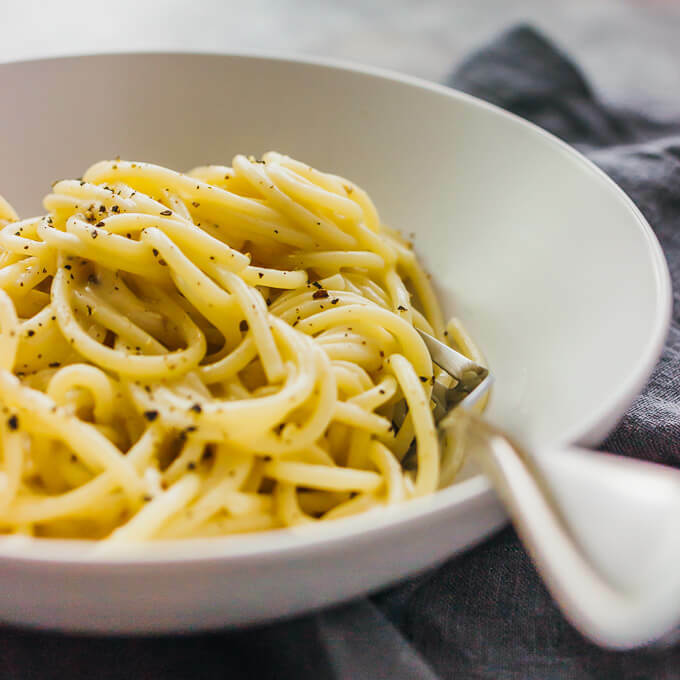 Cacio e pepe or “cheese and pepper” is a great Italian meal to throw together on a weeknight. 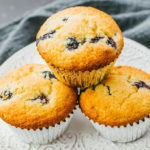 It’s tasty, easy, and quick with only four ingredients used in the recipe. All you need are spaghetti, olive oil, pepper, and finely grated parmesan cheese — you might even have these ingredients on hand, letting you skip a trip to the grocery store. My version of cacio e pepe uses only one pan, re-purposing the water from cooking the spaghetti to form the parmesan sauce. 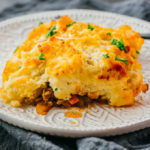 The resulting dish strikes a nice balance between the creaminess and the pepper flavor. If you make pasta dishes frequently, you’ve probably seen the trick where you add pasta water — the starchy water remaining from boiling the pasta — to the sauce. 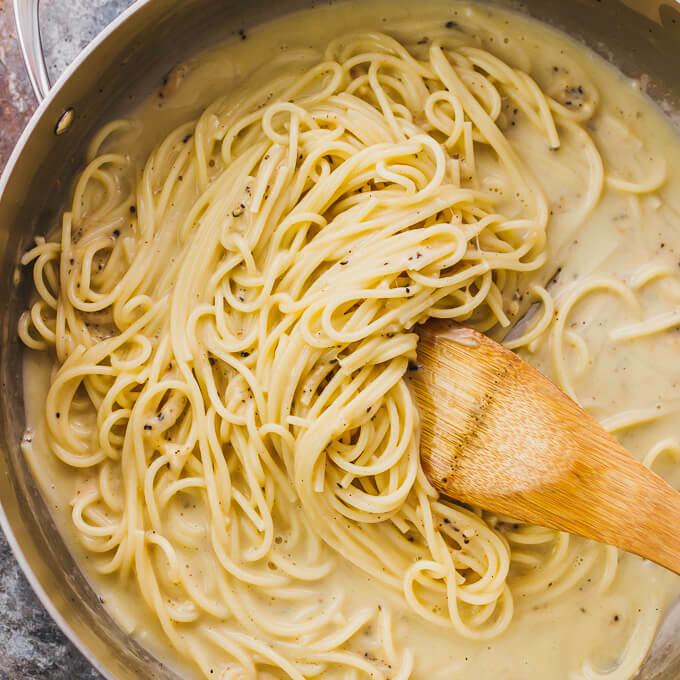 Since my version of cacio e pepe only uses one pot, the pasta water is automatically recycled to form the base of the parmesan sauce. It’s like having built-in sauce, which is great since the recipe only has four ingredients. It’s a technique similar to how I make my one pot spaghetti aglio e olio with sun-dried tomatoes. After cooking the spaghetti, there should still be a substantial amount of liquid left in the pan. If your pan is too dry, just stir in additional water. 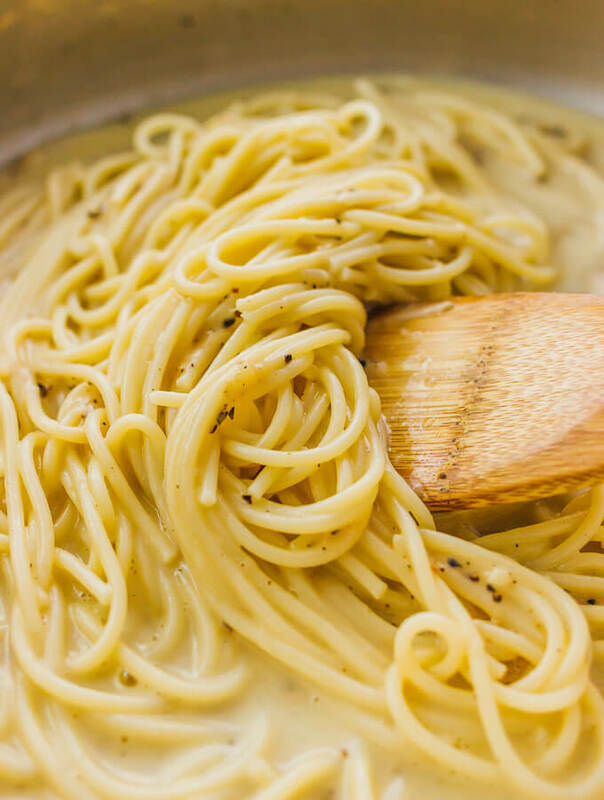 That liquid is important, as it makes it easier to stir in pepper and parmesan cheese, and results in a smoother pasta without the spaghetti sticking and clumping together. It’s important to use parmesan cheese that is finely grated with a sandy texture. You can find it easily in any grocery store. The finely grated cheese melts more easily and evenly in the hot pan with the spaghetti. 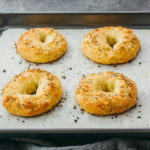 There are so many side dishes that pair nicely with cacio e pepe — ideas include garlic dinner rolls or crusty bread, green beans with feta cheese, orange roasted carrots or cauliflower, and asiago stuffed mushrooms. 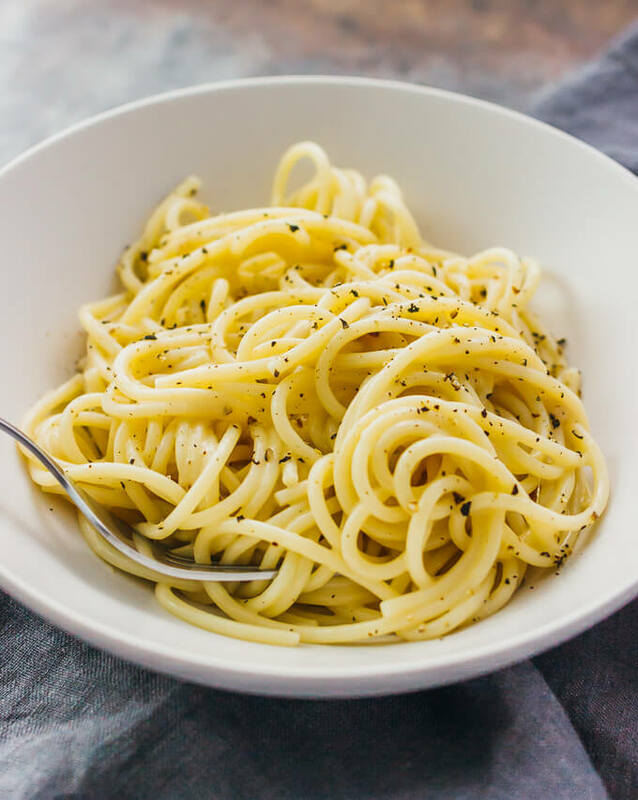 Cacio e pepe is one of the simplest pasta dishes you can make -- spaghetti with melted parmesan cheese and black pepper. Add olive oil, spaghetti, and 4 cups of water to a large wide pan. Bring to a boil over medium-high heat. Boil until spaghetti is tender, about 10 minutes, stirring occasionally. Add pepper and stir for a minute until well-mixed with the pasta. Decrease the heat to low. There should still be liquid in the pan that will help form the sauce; if not, add 1/2 cup water. Gradually stir in parmesan cheese until melted. The spaghetti should be coated with melted parmesan sauce. Serve immediately while warm. Optionally garnish with additional pepper.